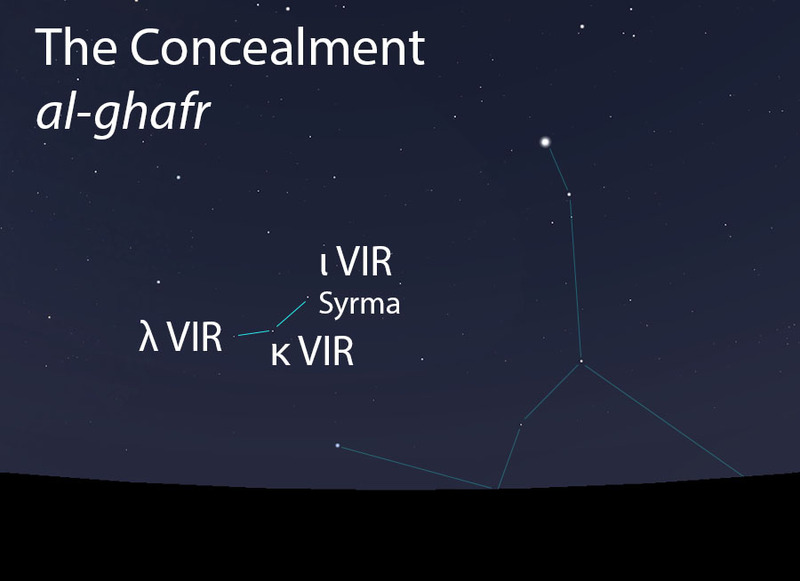 The name al-ghafr comes from the verb ghafara, which means “to conceal, cover or hide”, so it plainly describes the faintness of this lunar station. Another possible meaning for this word is the downy hair that appears on the back of a person’s neck, as well as other places on the body, so named because it is not easy to see. 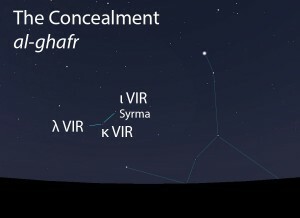 The Concealment (al-ghafr) as it appears in the west about 45 minutes before sunrise in late April. A trio of faint stars that follow in the path of the Unarmed Sky-Raiser, which is known in modern times as the star Spica. The Concealment does not figure in the calendar of the rains stars. In early listings of the lunar stations, the Concealment is the 17th station of the year. This was later changed to the 15th lunar station after the stations were adjusted to begin with the vernal equinox. The Concealment was called “the most fortunate lunar station for time without end, between the Scorpion and the Lion” because it lies between the hind legs of the Lion (al-asad, الأسد) and the claws of the Scorpion (al-‘aqrab, العقرب), and yet it is never harmed. For the rest of time, this lunar station is concealed from those two formidable beasts.